Students and staff at St. Francis School in Harbour Grace are receiving grief counselling. 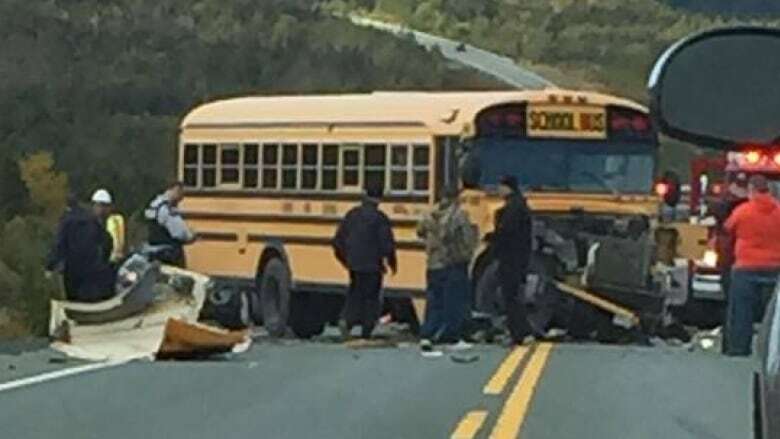 The driver who died after her SUV crashed with a school bus on Veterans Memorial Highway Thursday was a primary teacher at St. Francis School in Harbour Grace. "It's a sad day in Harbour Grace, and as chair of the school council, for the community of St. Francis, the loss is devastating." said Mayor Don Coombs. Emergency crews were called to the scene of the crash, which shut the section of the highway between Makinsons and Roaches Line, for about four hours Thursday afternoon, police said. The passenger in the SUV was taken to hospital with serious, but non-life threatening, injuries, RCMP said in a media release Friday morning. One of the 12 children on the school bus received a minor injury, RCMP said Friday. The driver of the bus was not injured. Mayor Coombs said the news has been very difficult for the young students, many of whom stayed home from school today, after the loss of their teacher. "A lot of parents called me last night, and their children were very upset upon hearing the news," Coombs said. A grief counselling team from the Newfoundland and Labrador English School District arrived in Harbour Grace on Thursday night, and is working at St. Francis School on Friday, as well as at schools in Avondale and Carbonear. "The school district came in with their counselling team and have done a tremendous, tremendous job up there at the school this morning." said Coombs. "They're helping staff to cope, and also the students to cope." In a statement, the NLESD said it is deeply saddened by the incident. "The district is providing crisis response teams and counselling and educational psychologist support to students and staff at Roncalli High School in Avondale, as well as to the school communities of St. Francis School in Harbour Grace and Carbonear Collegiate, which are impacted by the death of an individual in a second vehicle involved in the accident," reads the statement. Several people took to social media expressing condolences to the staff of St. Francis School in Harbour Grace, in addition to the friends and family of the teacher.